"No S26 is still alive!" 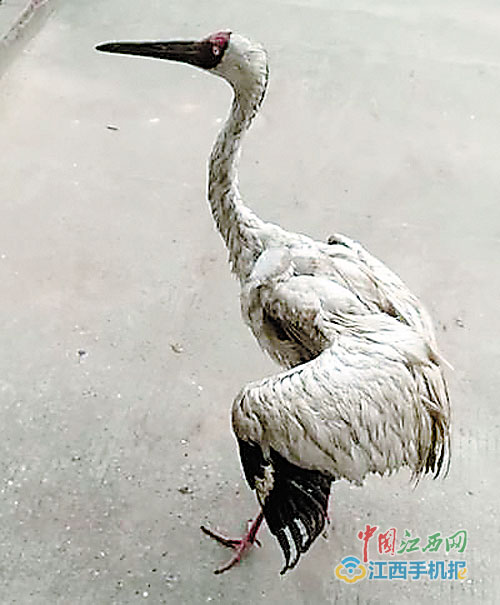 Wang Zhiru, director of the Wildlife Rescue and Breeding Center at Jiangxi Academy of Forestry, exclaimed with relief upon receiving a picture of a white crane on January 3, 2019. For a full 219 days, Wang’s team had not received any data from the tracker on the bird they named Love after it was rescued and set free in early 2018. The white crane has a global population of less than 4,000 and is under first-class state protection in China.Love was first spotted on April 24, 2018, when Li Zengming, a farmer, drove past a reservoir in suburban Nanchang, capital of East China’s Jiangxi province. The province’s Poyang Lake is a major habitat for migratory birds. Seeing it struggling to fly but failing repeatedly, Li figured that it may be injured. He drove to the shore, parked the car, picked up a stick, took off his clothes and went into the water to save it. "I saw the white crane with dull, glassy eyes and a weak body. It was probably injured. 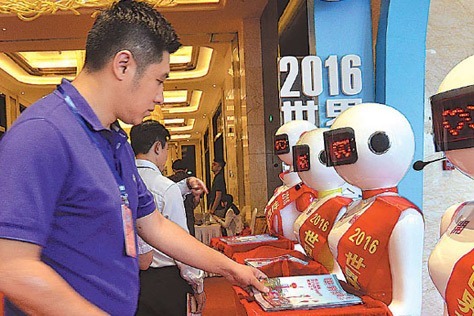 If I left it alone, it would be in danger," Li recalled. After more than half an hour’s endeavor, Li finally took the white crane back to the shore. A man riding a motorcycle passed by and saw the bird. "Will you sell it?" he asked. "Sell it? Definitely not!" said Li, shaking his head. Then he called his uncle Li Mingquan, an experienced animal saver, for help. "Come over immediately and let’s send it to the police station right away,” said his uncle. 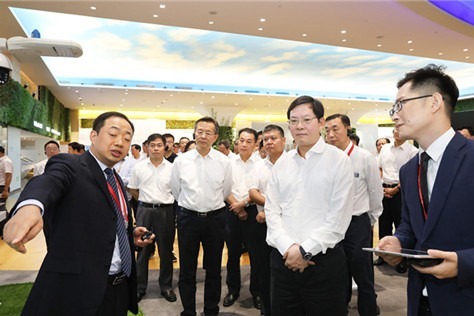 When seeing the weak wild crane, Jiang Qingchun, deputy director of the Five-Star Police Station, High-tech Branch, put down his work and checked it carefully. "At the end of April, migratory birds usually return to the north. It’s abnormal for a white crane to still be living nearby. It may have been left behind because of its poor physical condition," Jiang said. He contacted Wang at the Jiangxi Academy of Forestry for help. Two hours later, Wang and his colleagues saw the white crane. They found the bird did not seem to have obvious injuries, but it suffered from malnutrition and exhaustion. 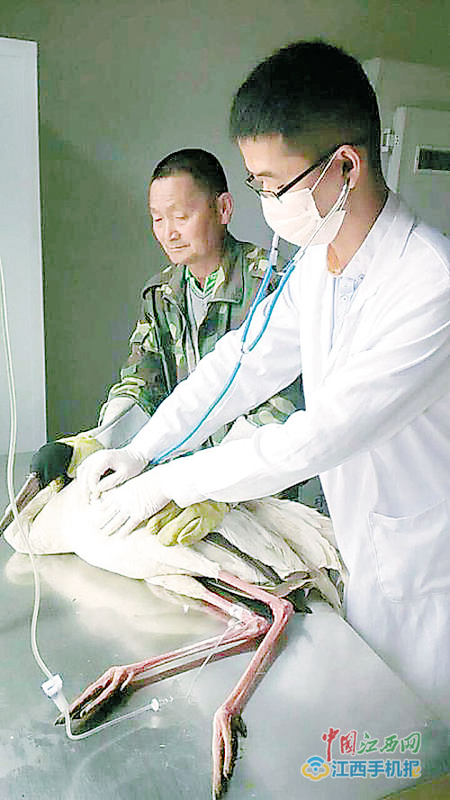 After five days’ treatment, the white crane recovered and foraged actively with its weight rising from 3.75kg to 4kg. Long-term captivity will affect birds’ ability to survive in wilderness. As it was recovering, Wang’s team decided on May 2 to set it free at a place in northern China where it could join the migrating group heading for Siberia in Russia. When the Jiangxi Wildlife Conservation Administration pinpointed two days later the location of the northward-moving group of around 1,000 cranes at the Momoge National Nature Reserve in Jilin province in Northeast China, there were around six days left before they were expected to continue the journey northward on or about May 10. Only by taking a plane could Love arrive at the location and catch up with the group. On May 4, local authorities in Jiangxi sent an official letter to Jilin province for a permission to set the bird free there. Two days later, a wooden box was made for the flight, and Wang’s team installed a satellite tracker on the bird, hoping that no matter where the white crane flew, its condition would be transmitted back in real time. On May 7, Love boarded a flight to Changchun, capital of Jilin province, via a green channel the air port authorities helped arrange. On May 8, Love was released at the Momoge National Nature Reserve. Wang recalled that when Love was first set free, it wouldn’t leave. It took quite a while for the bird to walk slowly towards the other cranes.